I can't believe we are already into week 5, how did that happen? When Kristin announced the colour for this week over at Twinkle Twinkle was brown I wondered what I could do that was a bit different. When I think of brown when creating, I think of grunge, antique, earthy etc. 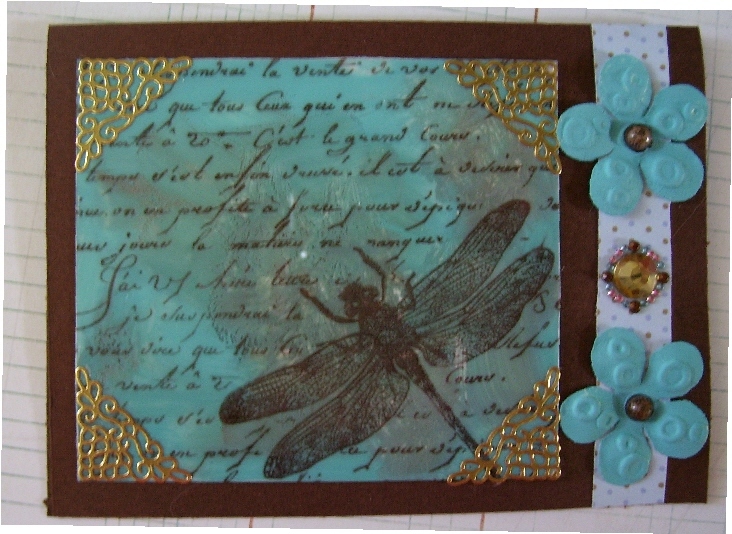 I was browsing the internet one night and on Splitcoast Stampers they had a tutorial on acrylic smash. When I read the title I thought, hmmm wonder what is up with that? So I investigated and found a technique I had not tried yet and I have tried a lot but this one really caught my attention, so much I have been doing a little out of the box type of things as well with this technique. Today however, I will show you my very first acrylic smash card in brown and we were challenged to use a colour that was bold to go along with the brown. Here I have chosen Indian Turquoise. And this card was a premade round card but I think I should have had the fold at the top for standing it up, I did a dahhhh after the card was made. Oh well, someone will still get it. I rather like how it turned out. I distressed a doily with Tea Dye Distress Ink then did my acrylic smash center piece. 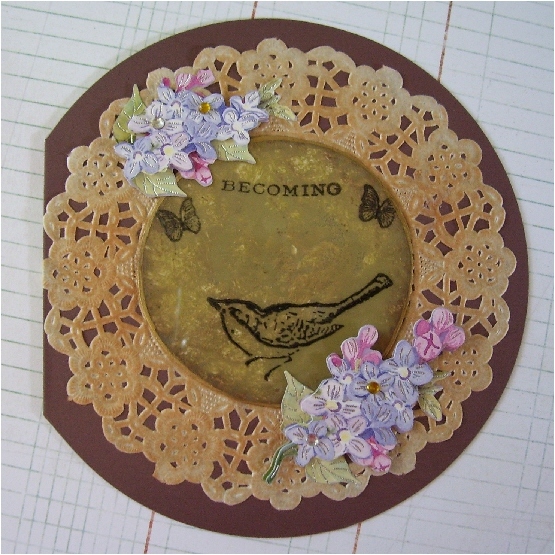 I used a drinking glass that fit the middle diameter of the doily almost perfect to cut the acrylic. I then added a few sprigs of flowers from some stickers in my stash. Wow that was easy and quick. I think I will enter this card into another challenge over at Just For Fun, you are to use acrylic in a piece of artwork. I think this should pass don't you? Don't forget to check the link to take you to Kristin's blog and look at all the wonderful artwork that everyone is doing. What a great way to meet new bloggers and get some new inspiration. Lovely work, as always, Les! I love that color combo. Haven't heard of acrylic smash before - looks great! That turquoise really does 'pop'! Omg Les, I cant believe that you managed to found a technique that you haven't tried yet!! lol - Your the technique queen!! Great techniques and lovely cards.